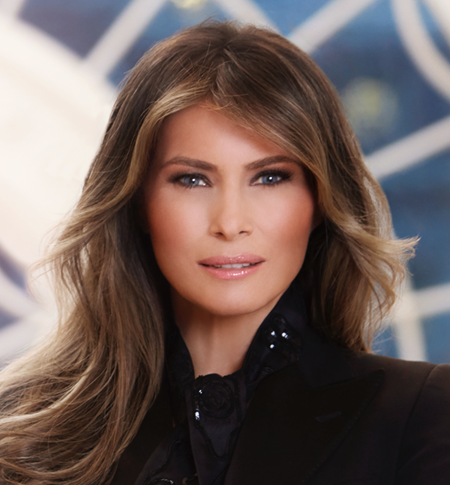 May 15, 2018 -- Interventional radiology was used in a May 14 procedure to treat first lady Melania Trump for a benign kidney condition. The procedure went well and the first lady is recovering at Walter Reed National Military Medical Center in Bethesda, MD, according to the White House. She underwent renal artery embolization at Walter Reed on Monday and is expected to stay there for the rest of the week. "The procedure was successful and there were no complications," the White House said in a statement. "The first lady looks forward to a full recovery so she can continue her work on behalf of children everywhere." President Donald Trump tweeted that the first lady was recovering well. "Our great first lady is doing really well," he wrote. "Will be leaving hospital in 2 or 3 days. Thank you for so much love and support!!" Renal artery embolization typically involves the insertion of a catheter under imaging guidance into the artery feeding a lesion in the kidney. Some type of agent -- a coil, tiny beads, or foam -- can then be injected to block the artery and stop the blood supply to the lesion, according to a statement released by the Society of Interventional Radiology. Although renal artery embolization can be used for cancer or traumatic injury applications, for Mrs. Trump it was planned for a benign condition, according to the White House. It's possible that the first lady had a benign mass on her kidney, or an angiomyolipoma, said Dr. Nicole Saphier of Memorial Sloan Kettering Cancer Center in New York City, according to a May 15 Fox News report. Saphier often serves as a commentator for the network. "She may have been having some back pain or blood in the urine, but most likely nothing serious," Saphier said. "They've probably been monitoring it for a while. [Renal artery embolization] is a minimally invasive, typically low-risk procedure performed by a radiologist, who inserts a catheter into the patient's arm or leg and cuts off blood flow to the area, causing the [affected area] to shut down." It's not unusual that Mrs. Trump will stay a few days in the hospital, Saphier said. "They're probably keeping her there because of her first lady status," she said. "But by the weekend, she'll be back to her Be Best campaign and raising her son."